The Israeli army is researching a new sensor-based system designed to detect tunnels being dug by Palestinian militants trying to infiltrate into Israel from Gaza. Disclosure of the tunnel detection innovation – said to have been developed by soldiers from the army’s Talpiot unit – comes after a two-and-a-half week ground incursion into Gaza during which military officials said they found and destroyed more than 30 tunnels. Destruction of the tunnels was identified as the main goal of the army’s Operation Protective Edge offensive after it switched to a ground invasion on July 17, having hitherto consisted largely of aerial bombardments targeting militants and rocket launching sites. Operational tests on the fledging new system are expected to be conducted soon, reported Israel’s biggest-selling newspaper Yedioth Ahronoth, which said it had been four years in the making. Developers have already carried out pilot tests on sewage tunnels in Tel Aviv. If further tests are deemed successful, the system could be installed along the 40-mile frontier between Israel and Gaza at a cost of $282 million and $422 million, according to a senior military officer quoted by Yedioth. Turkey’s president-elect Recep Tayyip Erdogan named Foreign Minister Ahmet Davutoglu to succeed him as ruling party leader and prime minister, promoting an ally who is expected to show unstinting loyalty to the new head of state. Mr. Erdogan – who has dominated Turkey’s political scene for 11 years as prime minister – is to be inaugurated as president next week after his election victory earlier this month. Mr. Davutoglu immediately vowed that “no seeds of discord” could be sown between him and Mr Erdogan, who wants to rule as a powerful head of state and is set to remain Turkey’s undisputed number one. Mr. Erdogan announced the decision on Thursday after a meeting of his Justice and Development Party (AKP) in Ankara, to cheers from the party elite and a blast of Turkish folk music. Mr. Davutoglu has been a loyal servant to Mr. Erdogan as an advisor before being promoted to the job of foreign minister in 2009. He enjoyed an elite Western-style education and is fluent in several languages but emerged as the chief architect and ideologue of Turkey’s assertive foreign policy under Mr Erdogan. 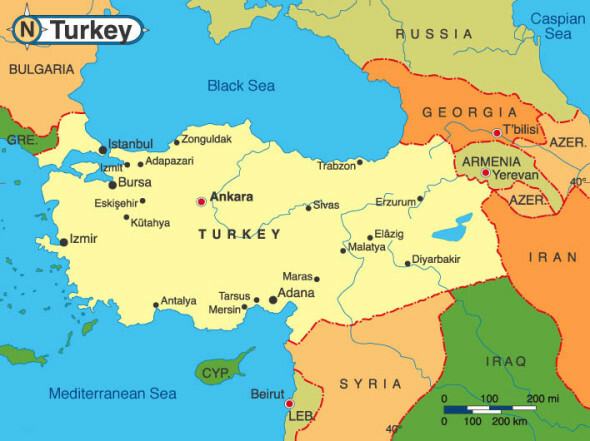 But while Turkey’s importance has unquestionably grown in the last years, critics say the policy has left Ankara [the government] isolated and surrounded by crisis-torn countries whose problems are spilling over the border. Mr. Davutoglu’s loyalty has never been in question and his first comments after being named indicated there would be no splits between his future government and president Erdogan. “I assure you that our party will continue to stand together. No seeds of discord can be planted between you and me, Mr. President,” he said. “This restoration movement which we started 12 years ago will continue without any interruption,” he added, referring to the period since the AKP [Erdogan’s party] first came to power in 2002. Opponents blasted the choice, saying Mr. Davutoglu would be no more than a puppet of Mr. Erdogan and the promotion was an unjustified reward for a disastrous stint as foreign minister. “One would wish that the office of prime minister is built upon achievements, not failures. Today Davutoglu is a man regarded more with criticism than praise,” said Aykan Erdemir, lawmaker of the opposition Republican People’s Party (CHP). Britons who travel to Syria and Iraq without informing the authorities should be presumed to be potential terrorists until proved innocent, London’s Mayor Boris Johnson says. An image grab taken from a propaganda video uploaded today by jihadist group ISIL allegedly shows ISIL terrorists at an undisclosed location in Iraq’s Nineveh province. The Mayor also joins calls for jihadists to be stripped of their citizenship, despite opposition from Theresa May, the Home Secretary, who warned over the weekend that such a move would be illegal. Mr. Johnson calls for control orders, which kept terrorism suspects in their homes, to be brought back amid concerns that hundreds of jihadists could return to Britain and pose a threat to national security if ISIS (the Islamic State) loses ground in Iraq and Syria. Mr. Johnson’s intervention came as Peter Westmacott, the British ambassador to the U.S., said intelligence agents believe they have identified “Jihadi John,” the Briton responsible for beheading the American journalist James Foley, after employing voice recognition technology. 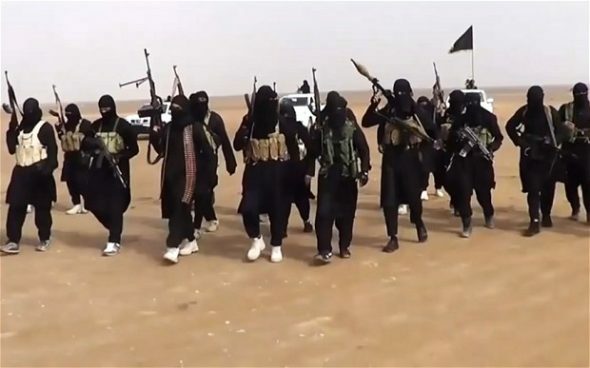 Ambassador Westmacott also disclosed that 70 militants have been arrested after returning from Syria, a number of them carrying instructions for “very specific missions” to unleash terrorist atrocities on British soil. Mr. Johnson says Britain needs to help to “close down” the Islamic caliphate* before it is too late, adding that “doing nothing is surely worst of all.” He says: “If we let [ISIS] get their way, then we will be acquiescing, first, in a gigantic and violent change in international borders. [*caliphate is a Muslim world government ruled according to sharia (Islamic law)]. “Next, we will be allowing a new and hideous regime to be born, a country where black-flag waving jihadis compete to show they have the most bigoted and reactionary understanding of their religion by persecuting women, Jews, Christians, gays, Yazidis ande Shi’ites. Senior lawyers said that Mr. Johnson’s proposals for “rebuttable presumption” would mark a “profound change” to British law. Earlier this year, British Prime Minister David Cameron announced new laws under which terrorist offenses committed in Syria will be prosecuted as if they have taken place on British soil. The lawyers said Mr. Johnson’s plans would go significantly further by shifting the burden of proof from police and prosecutors on to suspected jihadists. Mr. Johnson also says that suspected terrorists who do not return to Britain and “continue to give allegiance” to ISIS should be stripped of their citizenship. Similar calls have been made by David Davis, the Tory MP, and Lord Carey, the former Archbishop of Canterbury. Welcome back teachers and students! PLEASE NOTE: “Answers” emails resume Tuesday, September 2nd. Questions or comments? Send us an email at editors@studentnewsdaily.com. NOTE: “Answers” emails will resume September 2nd. b) How many Hamas tunnels into Gaza has the IDF (Israeli Defense Forces) destroyed so far? c) What is the purpose of these tunnels? d) How important is it to destroy these tunnels? Explain your answer. b) What is the role of the president and of the prime minister in Turkey’s government? 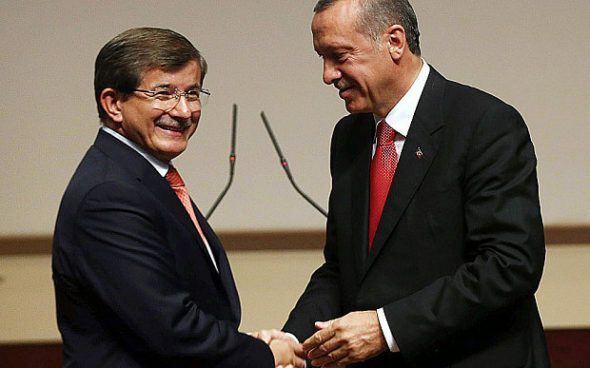 c) What do opponents fear Recep Erdogan is trying to do with this balance of power in Turkey? CHALLENGE QUESTION 2: Read the opinion about Erdogan’s transition from Prime Minister to President at: theglobeandmail.com. What concern does Mr. Khan have over Mr. Erdogan’s election? b) Define jihadist, rebuttable presumption and caliphate as used in this news report. c) For what reason does London’s mayor Boris Johnson want to bring back control orders, as well as change the law specifically for those who travel to war zones without notifying British authorities? e) What do you think British authorities should do with British citizens who travel to wage jihad and then return to England? f) Do you think the U.S. government should be proactive in addressing this potential problem in the U.S.? Explain your answer. DID YOU KNOW? StudentNewsDaily now has an app. Go to studentnewsdaily.com/current-events-app/ for the links. When Hamas came to power in Gaza in 2007, the Islamist group set aside tunnel building and focused its military funds on rockets, according to analysts and former military officials. Tunnel building was revived a few years later, however, by Israel’s development of the Iron Dome air-defense, which largely neutralized the threat of Hamas’s rockets, said Eado Hecht, a defense analyst who teaches at Bar-Ilan University in Israel. Israeli spy agencies rely on information collection methods ranging from informants to technologies capable of sweeping up cellular and electronic communications in the Palestinian territories. Hamas countered that capability by wiring its longer tunnels with communications cables that weren’t connected to the local telephone grid, the officials said. Israel could figure out the origin of some of the tunnels because diggers’ cellphone signals would abruptly disappear when they went underground and then reconnect to the network hours later when they emerged, but that didn’t indicate where the tunnels led, officials said. Hamas tunnel builders were aided in maintaining secrecy by layers of densely packed sediment between 30 and 60 feet below Gaza’s surface, which geologists say was ideal for tunnel construction—not too rocky to dig through but not too loose to collapse. This soil composition also made it difficult for Israel’s ground-penetrating radar to locate the tunnels, current and former U.S. officials said. The tunnels were also built with multiple exits, a senior Israeli military officer said, meaning that discovering and destroying one opening didn’t mean that the whole passageway was put out of use. 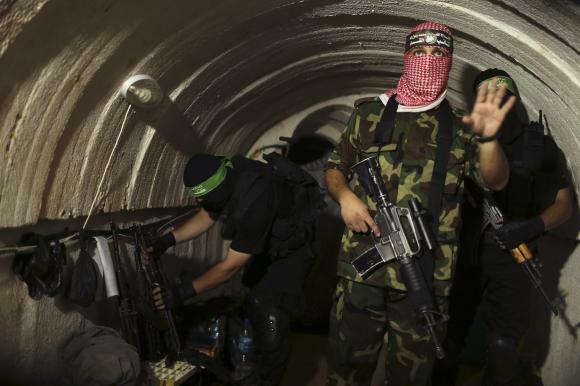 Some senior American officials and experts say Hamas’s ability to burrow so many tunnels into Israeli territory amounted to an intelligence and strategic-planning lapse for Israel and a coup for Hamas. Attempts to address the tunnel threat date from 1990, when the Israeli military and its procurement agency asked the Geophysical Institute of Israel to make recommendations for tunnel detection. Two Israeli geologists approached the Defense Ministry in the early 2000s with a proposal to dig a moat around the Gaza Strip to stop tunnel building. The ministry spent $300,000 and several years studying the idea but never commissioned it. Yossi Langotski, the deputy director of the Israeli Geology Institute, urged investment in subterranean detection technology for more than a decade. A race is now on among Israeli entrepreneurs and government agencies to come up with a system to detect and prevent future tunnel incursions. Magna DSP, an Israeli firm that specializes in infrared intrusion-detection systems already in use at the country’s borders and airport, recently proposed its technology for use against the tunnels and plans to conduct a test of the system within the next two weeks. Sensors would be installed in 20-meter-deep trenches at one-kilometer intervals along the Gaza border. Technologies using seismic waves or audio signals could eventually be installed to supplement it, said lead scientist Levy Zruya. Mr. Erdogan has vowed to break with the tradition of ceremonial presidencies in Turkey and be a powerful head of state who will use powers that have lain dormant for years such as chairing cabinet meetings. Mr Davutoglu’s nomination paves the way for a wider shake-up of Turkish politics that is expected to follow Mr Erdogan’s inauguration on August 28. Turkish media reports have predicted a cabinet packed with Erdogan allies, in an indication the new president plans to keep a tight control over government. In a notable move, the head of Turkey’s National Intelligence Organisation (MIT), Hakan Fidan, a staunch Erdogan ally, is tipped to take over from Mr Davutoglu as foreign minister. Outgoing President Abdullah Gul had been seen as a candidate for the premiership but had the door slammed shut on him in what many saw as ruthless humilation by his enemies in the AKP. The Prime Minister of Turkey is the head of government, and of a multi-party system. The prime minister is the leader of a political coalition in the Turkish parliament and the leader of the cabinet. The prime minister has the power to dissolve the parliament and thus force a new election, which he is obliged to do within four years of the previous elections. The President of Turkey is the head of state who holds a largely ceremonial role but with substantial reserve powers. The Presidency is largely a ceremonial office but has some important functions. In this capacity he represents the Republic of Turkey, and the unity of the Turkish nation; he ensures the implementation of the Turkish Constitution, and the organized and harmonious functioning of the organs of state. The office of the President of Turkey was established with the proclamation of the Republic of Turkey on October 29, 1923. Turkey’s political system is based on a separation of powers. Executive power is exercised by the Council of Ministers. Legislative power is vested in the Grand National Assembly of Turkey. Prime Minister Erdogan’s critics have increasingly accused him of brooking no dissent and harboring a secret agenda to turn Turkey into a religious society [although Islam is the dominant religion in Turkey, the government has been secularist for 100 years – research Ataturk for info]. In early June 2013, resentment against his rule boiled over into mass protests by those who did not vote for Erdogan’s AK party in the June 2011 general election. Mr. Erdogan’s main ambition in his current third term is to rewrite the constitution. There is speculation that he wants to concentrate more power in the hands of the president – and then move into that post himself. He has denied wanting to impose Islamic values on his countrymen. He has said he is committed to secularism – although he does not think it should be at the expense of Turks who want to express their religious beliefs more openly. And that includes his wife Emine, who wears a headscarf. The garment has long been outlawed in government offices, schools and universities – but that has not stopped Mrs. Erdogan wearing hers to official functions. Critics also point to his failed bid to criminalize adultery, and his attempts to introduce “alcohol-free zones,” as evidence of his alleged Islamist intentions. Read the Israeli Defense Force’s (IDF) explanation of its “Operation Protective Edge” at: idfblog.com/operationgaza2014.